Autobarn Dubbo is one of the leading Autobarn stores in Australia having won the national franchise in 2012/13 and Best State Franchise in 2010, 2011 and 2012. With the store operating 7 days per week, the manager/owner, Mr Neil Sturrock was looking for options to reduce the operational costs of both the store and his very busy workshop. Energy efficiency was one of the major considerations. The cost of power has increased by up to 90% over the past few years, and with the extended opening hours of the store, this was an area that was highlighted as a primary target. Neil's major objective was to reduce current and projected energy costs and also reduce the stores carbon footprint. As a result of the above processes, we were able to secure an $8,000PA reduction in the current electricity account. This allowed the management to apply these savings to other areas that would further reduce the energy savings. A full site assessment was conducted of the lighting that was installed. By retrofitting all of the lights along with a few modifications, we were able to reduce the lighting usage from 68,169kWh to 30,677kWh per annum. This represented a reduction of 37,490kWh and under the original contract represented a saving of $11,622 per annum in year one. This also removed 39.7 tonnes of CO2 PA from being emitted into the atmosphere. Below are photos taken in the store before and after the lighting retrofit. The engineering and design were based on the current power contracts with Regen's primary objective to reduce or eliminate as much of the peak and shoulder periods of the usage as possible. Autobarn Management engaged the services of Scott Hansen of BTS Energy as the principle installation contractor. Scott subsequently engaged local company, Geoff Abbott Electrical services to assist with preliminary site issues. The installation was carried out by the BTS Energy team over a five day period, with the system being commissioned on the 24 May 2013. Regen Power also supplied a power monitoring system for the project. This system allows selected parties to monitor the performance of the installation remotely. Below is a snapshot of a couple of days production from the Dubbo system. "Quality above and beyond the standards." The system has consistently generated over 100% of the daily expected yield of 142kWh. This reflects the proactive design of the Regen systems. Consistently, even during the current winter months, over 200kWh of energy have been produced at the site in one day. There is also a once off payment from the Energy Savings Certificates rebate in year one. This is paid as a lump sum payment and is not included in the figures. The estimated savings generated in year one ($31,315) is a recurring payment each year. This figure is based on the current cost of power that the site is currently paying. As power costs increase this figure would also increase. This figure does not include any tax or depreciation allowances. Below are copies of the pre and post energy accounts for the main store. There has been a significant reduction is the usage at the site and subsequently, these savings have a flow on effect to the network and ancillary charges. I hereby confirm that at Autobarn Dubbo we have purchased and recently installed a 40kw Solar system onto our shop roof in Dubbo through BMC Energy Systems. 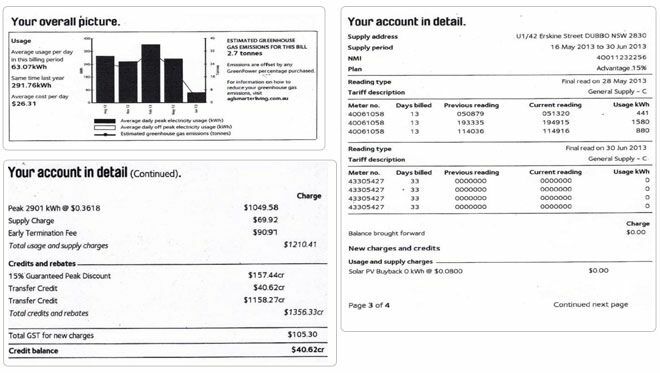 This week I received my first account for electricity since the installation and am delighted to say that my $8400 bill for 3 months up to May 2013(average 273kWh/day at a cost of $103 per day) has been replaced by a $40 credit for 1.5 months ending 30th June (average 63kWh at a cost of 26.31 per day). To achieve this fantastic result, Barry came to Dubbo, studied our previous electricity usage and charges and consulted with me on ways to reduce our usage by changing all of our fluoro and Hi bay lights to LED. We also changed our electricity provider to obtain a much better rate and then financed the purchase and installation of the Solar System on the roof. The entire project from start to finish was led by Barry professionally and ran like clockwork, the result I was after was to have a enough solar capacity to operate my shop, my first account shows clearly that this has been achieved, my electricity account has been replaced by finance payments for the next 3 years, and then I will be in a building with no power costs and much more carbon friendly!!! Thanks Barry, and your team for a project well done!